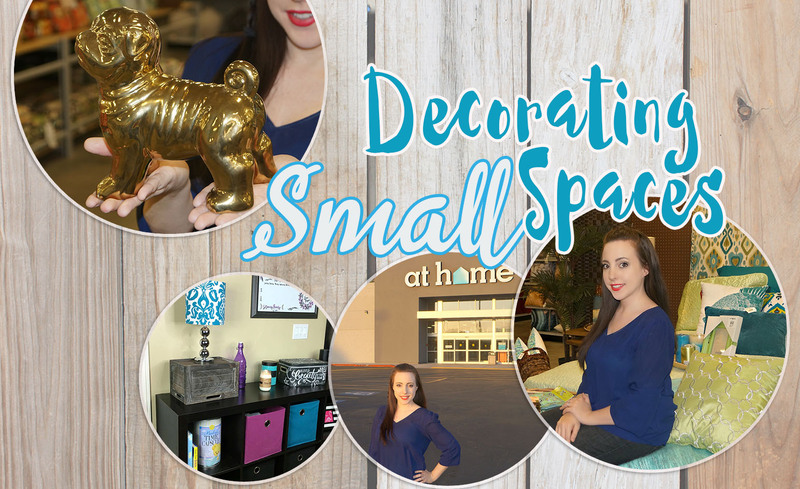 I love finding new and fun items for decorating my home and office but finding great items AND great deals is even more exciting, which is why At Home is one of my FAVORITE home decor stores! I’m SO EXCITED that I’ve partnered with At Home and Mom Select, to bring you a few tips and tricks for decorating your small space on a budget. As you plan and shop for dorm decor this summer, or even if you’re decorating a space in your home or office, be sure to check out some of the awesome items that At Home has to offer. If you haven’t been to an At Home store, you are seriously missing out! The entire store is filled with any and all types of home decor items you could ever imagine. Our location has a seasonal section (where we buy all of our holiday decor), a patio section for outdoor items, furniture, rugs, pillows, home textiles, art & wall decor, home organization, housewares, and all kinds of decor items. We go often and always find great new products each time. For this project, I decided to focus on an empty wall in our kitchen/dining area. I love having a blank canvas to work with and I’m really pleased with the results! When it comes to decorating, there are many fun options and tricks that you can use to many the most of any space in your home or office. Small spaces are a little tricky, but they are not impossible! The key to making a smaller space work for you is to focus on both style AND functionality. First, take measurements of the space you have so you know what items will fit. Next, browse through a few ideas on Pinterest or in magazines to see which style best suits you (Here are some of my favorites) to help you narrow your focus while you shop. If you have several areas to decorate, it may be easier to focus on one room at a time. There are two ways to shop: you can make a list of what you’re looking for and seek out specific items, or you can go shop for whatever catches your eye. If you’re heading to college, be sure to download and print At Home’s 2016 Back to Campus Planning Checklist before you shop! Each area in your home or office will have a few main pieces. For this project, I used a bookshelf that I already had. It fit perfectly into the space and gave me more room to work with. At Home has a variety of stylish and fun furniture to choose from, from dressers to night stands and all kinds of shelves and tables. When you choose your main piece, keep in mind that you want to select something that will not only look nice but also function for you in your space. This particular shelf matched our existing dining chairs and table so it was perfect to use for this area in our home. With a small space, you are often limited with what will fit. Refer to your measurements and ask yourself: Will it fit? How far will it stick out into the room? Will it block any important outlets, vents, or other areas? My 8-cube shelf is open in the back and was the exact width of my space so it was perfect. The great thing about a space is that most of the time you are limited in width and depth but not height. The width of the area I was working with was small, but by selecting a piece of furniture, I could create my own space vertically. At Home has a great selection of items that help you get organized. What I love about cube shelves is they offer endless possibilities for what you can do with each cube. I chose 4 storage baskets from At Home that are made for this type of shelf and placed them into the 4 center shelves. This now gives me storage for items that I want handy in my space but don’t necessarily need everyone to see. I keep my workout gear, boys’ art supplies, costumes for the boys to play with, and some non-breakable kitchen gadgets in each of the cube. If you’re in college, you can use something like this for storing snacks, homework, chargers, mail, clothing, personal care items, video games or movies, etc. When you decorate your space, determine what color palette you will use. Choose a neutral color (usually either earth tones, black or white, or grey work as a great base). Then, select two or three of your favorite colors and find items that add pops of color to your space. At Home offers a HUGE selection of fun, bright items that are perfect to add that extra touch to any space. My favorite colors are teal and purple, so I chose a decorative bottle, a chalkboard canister (again, storage that looks stylish). I found a fun lamp and lampshade (yes, At Home lets you mix and match with a TON of possibilities) that was perfect for this space. I also added a candle. Both provide sources of light in different ways and help make my space feel warm and inviting. When you want to create a fun and stylish space, it’s important to create dimension with items that vary in size and height. If everything on top of the bookshelf was the same height, it would look rather boring. Instead, I selected a few items that were tall in varying heights. I also found a great wooden crate box to place under my lamp allowing the lamp to be even taller (which also lets a bit more light into the room). I found another fun storage box and placed it on the opposite side of the bookcase. Again, style + functionality. This is where I keep important mail and other paperwork before I file it away in the office. Eliminating clutter is always a good idea for small spaces. Instead of piling these items on the counter when I get home, I sort the mail right then and place important items in my box until I have a chance to put them away. What people see is a fun, decorative box but for me, it serves its purpose! Another way you can create dimension is to add a mirror that will give an illusion of a bigger space and help reflect light back out into the room. Once you get your main piece and items into your space, it’s time to add a few personal touches. I added some books, a black and white striped picture frame, a nice candle to enhance the environment, and a really cool weekly family calendar that I made using one of the cool frames from At Home. Let me tell you just what I did because this would totally work great for college students, moms, professionals, and anyone who likes to get organized! At Home has many great items at awesome prices but one of our family favorites is their huge selection of oversized poster frames. Believe it or not, I got this frame for only $15! Then, I designed a family calendar on a poster board to go inside. Mine has a section for weekly appointments as well as a family menu area for lunch and dinner (we are going to start meal planning next week). I added our family name, some decorative designs, and my husband’s favorite quote to personalize it. Next, I placed it into the frame and hung it on the wall. I will be able to use a dry/erase marker on the glass of the frame and it will function as a personalized board. Whether you are an Instagram superstar or you just snap occasional selfies with your friends, your small space will likely double as a backdrop for many photos. When you take the time to plan it out carefully and choose pieces that offer both style and functionality, you’re able to create a nice environment that looks great in photos and also offers you storage solutions to hide all the clutter without compromising on space. If you have items you don’t necessarily want in photos, just toss them in a storage box or basket away from sight but still close enough to access. Choose items that help you eliminate clutter and a color palette that works for you. Consider adding a small speaker or other sound device that will provide a fun or soothing atmosphere. At Home offers a great selection of candles, potpourri, and other scented items. Consider using a canister or decorative bowl to have snacks and candy ready to access for guests. If you have items that are more personal, place them inside a storage box for privacy and safe keeping. Overall, on a very small budget, I’ve transformed a blank wall into a nice family center that provides both organization and functionality as well as big style in a small space! I love this area in my home and CAN’T WAIT to work on my next home decor project! The first time we visited an At Home store was when we moved to Utah. This is our Provo location and it’s AMAZING! We literally go there several times a month! You use the At Home website to FIND A STORE near you! This post was sponsored by At Home in partnership with Mom Select. All thoughts are my own. Oh my gosh. I just love your blogs. They are always so informative and this one is filled with great ideas. I need this store in our town. Thank you for sharing all this. Thank you so much, Marcie! This store is AMAZING! You would love it! You should have seen the selection of Christmas decor that they had last year. We got so many cute things!